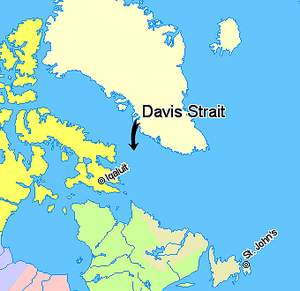 Davis Strait is a northern arm of the Labrador Sea. 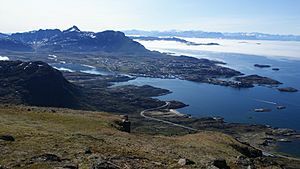 It is between mid-western Greenland and Nunavut, Canada's Baffin Island. The strait was named for the English explorer John Davis (1550–1605), who explored the area while seeking a Northwest Passage. It is the world's broadest strait. The water depth is between one and two thousand meters. The strait is much shallower than the Labrador Sea to the south or Baffin Bay to the north. It is on the coast line of Canada. Davis Strait Facts for Kids. Kiddle Encyclopedia.